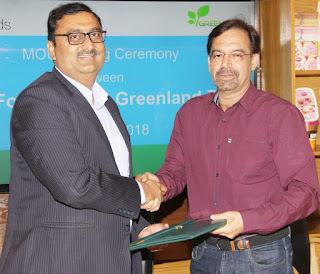 Engro Foods Limited – a leading enterprise in packaged milk and dairy products has signed a Memorandum of Understanding (MoU) with Greenland Zone – a progressive provider of farm machinery and financial assistance for the agricultural sector. The objective of this collaboration is to enhance the productivity of dairy farms, by facilitating the acquisition of modern farm machinery and equipment, while imparting valuable training to the farmers for capacity-building. Deployment of modern technology promises to be a game-changer for Pakistan’s traditional farming sector. This will ensure the production and distribution of quality milk for the masses, while increasing the profitability and prosperity of the agricultural sector too. This alliance enables Engro Foods and Greenland Zone to empower the local farmers, by guiding them towards farm-mechanization which will in turn lead to an increase in quality and quantity of diary production. Thus, the two organizations have pledged to nurture a healthy and prosperous society. Engro will provide consultancy and deeper insights after evaluating the farmers’ technological needs. They will then recommend the right machinery needed for higher profitability for the farmers. Greenland Zone will then facilitate the acquisition, installation, training and maintenance of the recommended equipment. This alliance is in line with the international initiative called ‘Global Dairy Development’ which is also being launched in Pakistan this year. The global initiative will give momentum to sustainable development of progressive dairy farming in the country.